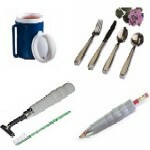 The Parkinson's Kit includes items every Parkinson's patient or person with Ataxia will find essential for daily use. 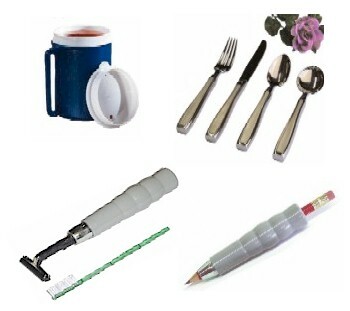 These items are the KEatlery Weighted Utensil Set, the Weighted Insulated Mug, the Weighted Universal Holder for Pens and Pencils and the Weighted Universal Holder to hold any round or irregular shaped object up to 1/2 inch in diameter. Each item is specifically designed to be heavy weighted for use by people with Parkinson's disease, Ataxia and other neurological disorders that cause the hands to shake or that cause the hands to tremor. The weight of each item decrease the tremors or shaking, allowing users to maintain better control of the item for independent use, eliminating the need for a caregiver. The KEatlery Weighted Utensil set is made from polished 18/0 quality stainless steel and include a tablespoon, a soup spoon, a fork, and a knife. The handles feature a slight indentation to place the fingers in a comfortable, ergonomical position. The soup spoon has a recessed edge and a slightly deeper bowl to assist with preventing spillage. Each utensil weighs approximately 7 ounces and is dishwasher safe. The Universal Holder for Pens and Pencils will securely hold most round or irregular shaped items (1/8" to 7/16"). It features three adjustable screws used to secure the item and requires very little pressure when writing if held in an upright position. The steel core is covered in a plastic vinyl handle with groves to fit the fingers comfortably. It includes an Allen wrench and weighs 7 ounces. The Universal Holder with a diameter of 1 1/8", a length of 5 1/4" and weighing in at 7 ounces, is perfect for holding toothbrushes and razors. It also features three screws that tighten in a triangular pattern to secure most objects up to a maximum of 1/2" in diameter, and comes with an Allen wrench. Please shop carefully, this product cannot be returned for hygienic reasons! 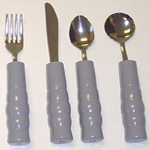 These Weighted Utensils with Contoured Handles decreases hand tremors for individuals with Parkinson's disease, brain injury or other neurological disorders. The weight of these utensils decreases the shakiness to enable the users to feed themselves.